Express Planner is free planning tool both for Mac and Windows. 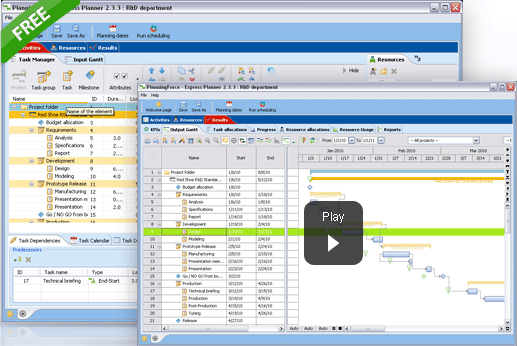 This free planning software is totally free and has amazing professional features. What you can do and get with Express Planner. You play with projects, tasks, resources and date constraints. You create and organize your resources the way you want. You can also define the availability of your resources by using calendars. You share resources between projects; the app will do what’s necessary to not over-use your resources. Don’t miss the new version that comes with a new scheduling mode which gives you still more control over your plan. When you feel comfortable with the scheduling results, you can print and export results as well. This free planning tool comes with its community where you will get access to free video tutorials, project planning templates and a forum. This planning software is perfect for small companies and freelancers wishing to plan their projects and anticipate the impact of new projects within their current portfolio. Click here to download Express Planner.